Sun is shinning, wind is not bitterly cold, and most of the snow is melted so it was time to back the kids up and go a Bald Eagle Hunt. I have heard there are couple at P.J. Hoffmaster State Park but we had not luck. We believe we did see one flying around Lake Harbor Park at the west point of Mona Lake, that will be our next adventure. No eagles today but still had great time walking out to the lake. The park for the most part is closed up for the winter but much activity is all around. Enjoy the trails, the lake, and the beauty in wooded dunes. If you are looking for a little more adventure during this years Fall Color Tour, P.J. Hoffmaster State Park is my recommendation to you. State Park is just south of Muskegon and north of Grand Haven in Norton Shores. Its close to US 31. 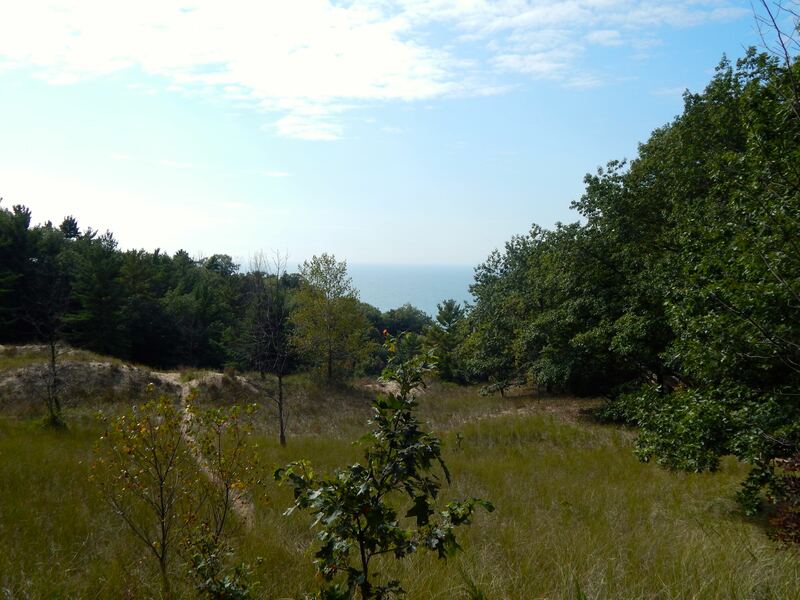 Hoffmaster has the Gillette Nature center, trials, beach, dune overlooks, etc. With Hoffmaster being on Lake Michigan, having large wooded sand dunes, and having Little Black Creek the park has great views of the lake, wild life and great scene views. 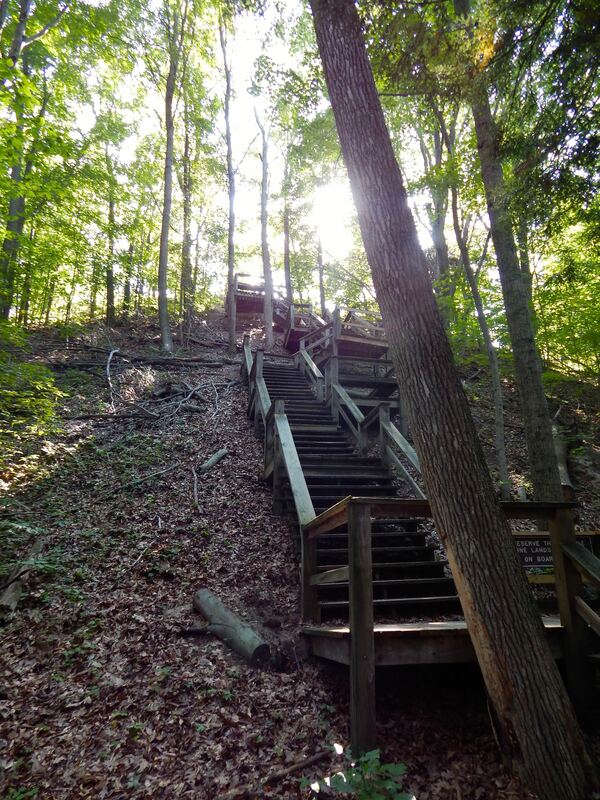 The park has some nice trails and paved trails benches along the way for all to enjoy but if you want a great workout the Dune Overlook Trail is for you with 118 step staircase to climb. I find the trails peaceful and active with wildlife. In the fall you can catch many birds on the migratory southern trip. On this particular trip we were followed along the trail by a Pileated Woodpecker. Its also not uncommon in the winter and early spring to see a Bald Eagle. This Fall Color Tour, get out of the car and take a hike. I don’t think you will be disappointed. ” We are excited for our upcoming NATIONALLY RECOGNIZED 3RD ANNUAL ‘MUSKEGON LAKE PROJECT’ this Friday, Sept. 11th from 6p-8p in our gallery!! Early this year the Muskegon Center for the Arts participated with the Muskegon Lake Watershed Partnerhip in their annual spring Muskegon Lake cleanup. Selected debris was given to local artists to create original works of art that will be for sale with a percentage going to the MLWP to further their efforts in keeping Muskegon Lake clean & habitat-friendly. Join us Friday, September 11th from 6p-8p at our Red Lotus Gallery for our opening. 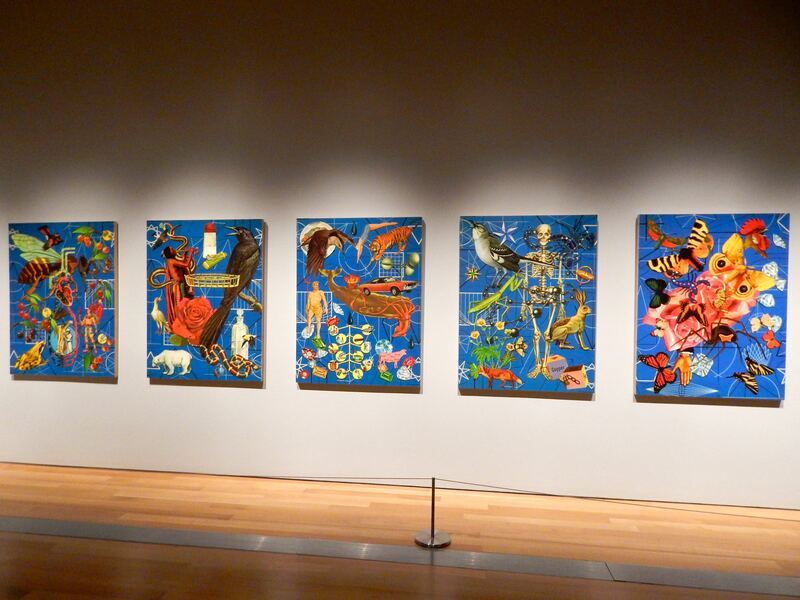 The show will be up through the month of September. Its a very busy Saturday in the Grand Haven/Muskegon area, seems more than the average person can fill into one day. Some are normal and others are special events. The Farmers Markets in Muskegon, Grand Haven and Sweetwater are all happening this morning. Muskegon Market has become a normal shopping event for me with grabbing a bite a lunch from one of the vendors like Whistle Punk Pizza or getting some cookies from one of the bakers. Muskegon’s Heritage Landing has Moose Fest, if you a country fan this is for you. Ross Park in Norton Shores plays host to it’s 39th Annual Art Fair, featuring wonderful displays of hand crafted goods available for purchase from 10:00am – 5:00pm. There will also be an Arts & Dash 5K run, food vendors and a beverage tent with a live music stage! This is a great time for family and friends to get together. Ross Park is located at Randall Rd. and Wellesley Dr. in Norton Shores. 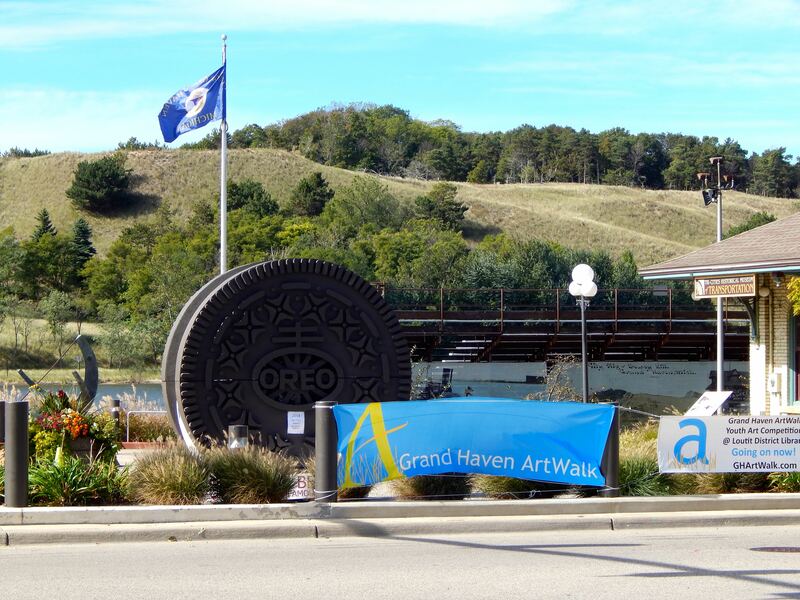 Grand Havens Riverfront has ‘Art on the Riverfront’, an outdoor, juried art show held along Grand Haven’s beautiful Boardwalk at the municipal marina. Show hours are 10am to 5pm. Grand Haven area locations are hosting Walk The Beat. 30 Different Venue locations in Grand Haven will host 60 Musical Acts (30 Bands/ 30 Singer-Songwriters) in one day. Over $20,000 worth of prizes. The beat is from 1-5pm and is free. One of my personal favorites performing is Uneven Ground at Walk The Beat.